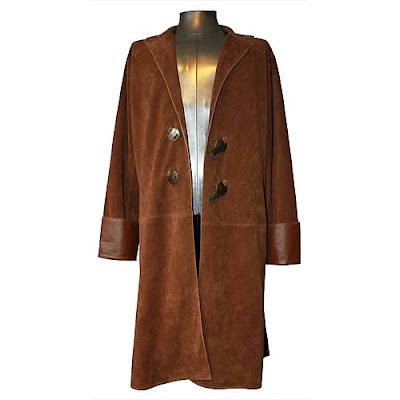 Did you hear about the official Malcolm Reynolds Browncoat Replica coat coming out next month? Not only is releasing a winter coat in March bad planning, did you see the price they slapped on that puppy!? $319.99!!! For that kind of dough we could buy every dvd you've ever been involved in with a Jayne hat or two thrown in for rep!!! What pisses me off the the most is that it made me take a closer look at the original. It turns out the coat is pretty lame unless Malcolm Reynolds is wearing it in a distracting manner. I remembered it being a solidly constructed, war worthy coat but this just looks flimsy and incapable of providing me with $320 worth of protection from the elements. Did you see the woman who dressed up as a Jayne hat for a convention? Rad.